The first 24 hours are crucial when you’re nursing an emaciated horse back to health, says Tammy Barnett, co-owner of the Horse Shoe Equine Rescue. That’s why she’s spent entire nights outside, in the freezing cold, monitoring and slowly feeding the neglected animals. Now, thanks to volunteers including members of Terre Haute, Ind., Local 725, those nights are over. The rescue, located just outside Terre Haute, recently experienced an uptick in the number of animals in need – it takes in all kinds. It also runs on donations of time and money. 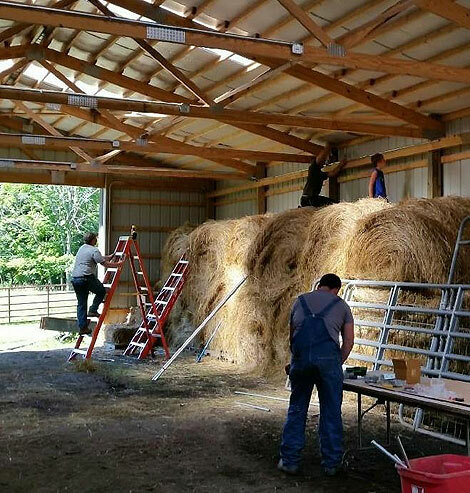 So, with a grant from the Wabash Valley Community Foundation, Tammy and her husband and co-owner, Ron, were able to afford a new pole barn with power, which Local 725 members installed for free. When the local got the call to help, members of the Reach Out and Engage Next-gen Electrical Workers chapter stepped up. RENEW is the IBEW’s initiative to encourage young workers to get involved with their local unions. Along with its counterpart in Canada, it comprises the RENEW/NextGen initiative. Local 725 members have helped animal shelters before, usually just installing new lights. But the Barnetts needed something different, said organizer Shawn Stewart. Fortunately for the animal-loving couple, Stewart had recently built his own barn. “Shawn had already gone through a lot of the trial and error, so we benefited from that,” Tammy Barnett said. About five members, including Stewart, have been volunteering their Saturdays to wire the new facility that will house the horses, hay and a tack room, where saddles and other equipment are kept. Some have even brought their kids with them, encouraged by Ron Barnett, to play with the animals. The team has installed about 26 LED lights and a panel so far. Once more of the barn is built, they’ll install overhead heaters and fans in the horse stalls and do the outdoor lighting. Supplies were donated by signatory contractor Crown Electric and others, Stewart said. They expect to finish sometime this summer. In addition to horses, the rescue, which opened around 2011, has taken in pigs, goats, donkeys and alpacas. When the weather permits, the Barnetts open the ranch to visits from the public, including developmentally disabled adults and children, to interact with the animals. Some of the adults help with cleaning and feeding. For many though, the animals provide some fun and even therapy. With the new facility, the Barnetts say they will be able to stay open year-round. “We’re just thrilled with everything they’ve done for us,” Tammy Barnett said.